Our team recognizes that the progress of synthetic biology and of science doesn't just come from one source. Interdisciplinary work and collaborations play a huge part in the advancement of our field. We formed partnerships with other iGEM teams to utilize different resources and gain insights that simply cannot be done by a single team. We gained an understanding of the perception of synthetic biology in different geographic locations through a joint human practices effort. Furthermore, we also mentored other teams and helped contribute to a human practices handbook. Synthetic biology is more powerful when we work together. For our collaboration, we worked with Stony Brook iGEM to understand people’s attitudes about synthetic biology in different parts of New York. Together, we wrote a survey to administer near our respective universities - us, in Ithaca and upstate New York, and them, in Long Island and New York City. We held weekly meetings over Skype to discuss where we wanted to go with our collaboration, focusing on using the strengths of both of our teams. We also developed skills in survey writing and distribution. We learned to ask questions that would improve the knowledge-base of our teams, and researched what we could uniquely investigate that could not be found online. Through reflection, reviewing literature, and thoughtful dialogue, we chose to focus on the comparison of perceptions of synthetic biology in different geographic locations. As student researchers from STEM backgrounds, we recognized the bubble we could potentially be in. Conducting this survey helped us pop that bubble. Together, both of our teams went through several iterations of survey drafts which we constructed together. We tested our surveys on small sample populations, and brought back feedback to clarify or rephrase our questions. When the questions were finalized, both teams went out to collect responses. Cornell iGEM visited the Ithaca Farmers’ Market as well as the Ithaca Commons during our annual Apple Harvest Festival to collect survey responses. We also visited the Great New York State Fair in Syracuse to gather responses from people across the state of New York. Stony Brook collected responses at their campus and online. Altogether, we had 92 survey participants. Our survey questions can be found here. We hope that other iGEM teams will follow our lead and conduct similar analysis in their communities. A larger percentage of people in Stony Brook claim they know what synthetic biology is compared to people in Ithaca. This relationship is statistically significant (p = 0.01). 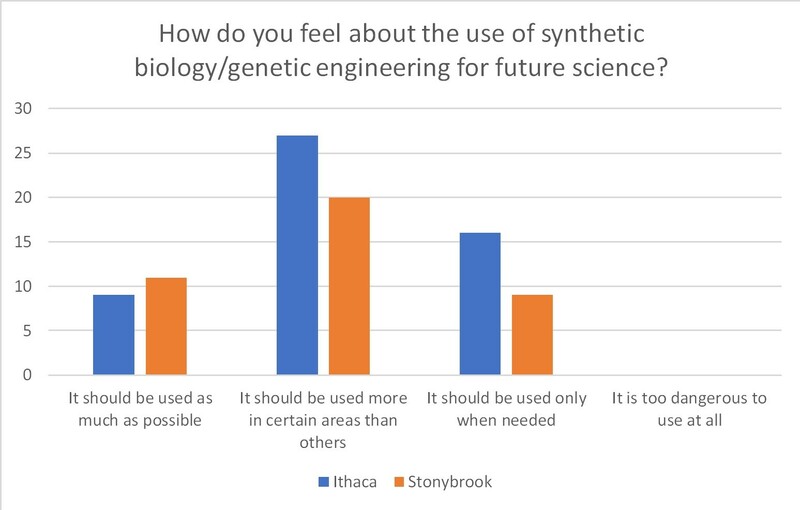 A larger percentage of people in both Stony Brook and Ithaca believe that synthetic biology/genetic engineering has a positive impact on the world. However, many people still believe that synthetic biology should be limited to certain areas in future science. There is a negative perception of the term GMO compared to the term synthetic biology. This reveals that there is a stigma against the phrase “genetically modified organism” even if the idea of synthetic biology is actually not opposed. 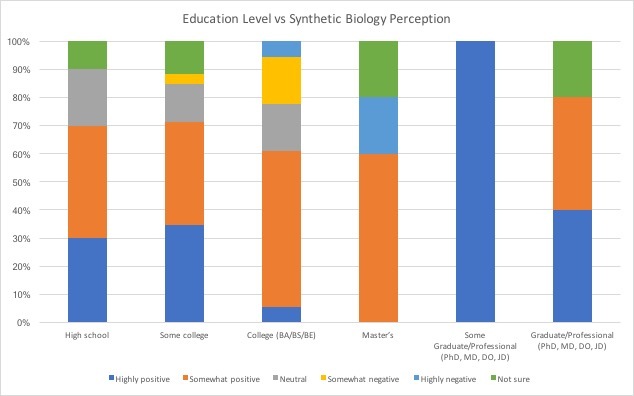 Demographics do not significantly affect perceptions of synthetic biology. When we started this survey, we wanted to know if people’s perceptions of synthetic biology changed depending on where they lived. Would people be more accepting of synthetic biology in New York City or Ithaca? What do they foresee in the future for genetic engineering? We had lots of questions, but few answers. Our survey allowed us to see the bigger picture. 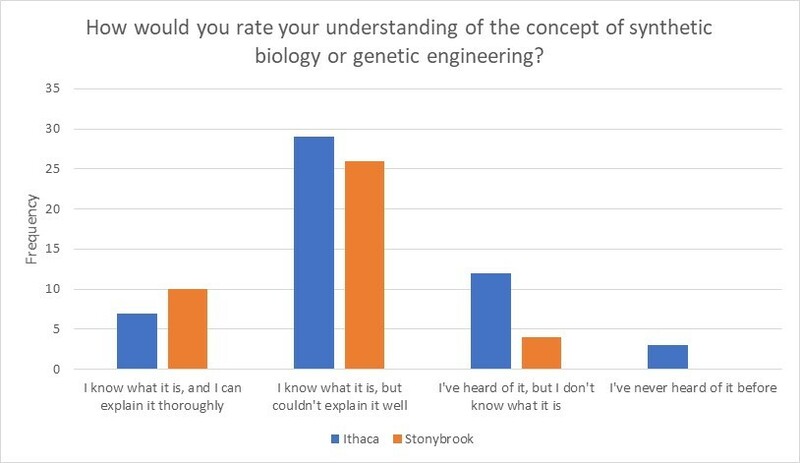 While the graphs of both locations have the same shape, it is clear that in Stony Brook, a larger percentage of people in their sample claim that they know what synthetic biology is compared to the percentage of people in Ithaca. After running a T-test, this was confirmed to be statistically significant, with a p-value of 0.01. This is an interesting result, since Cornell is a larger institution with easy access to events, seminars, and programs. However, perhaps it shows how segregated Cornell’s student body is to our community, and how we need to interact with our town more. We also wanted to know how people felt about synthetic biology, so we asked “how do you feel about the impact of synthetic biology on the world?”. Our data was skewed right, and we were overjoyed to see that a lot of people viewed synthetic biology as a positive influence on the world. 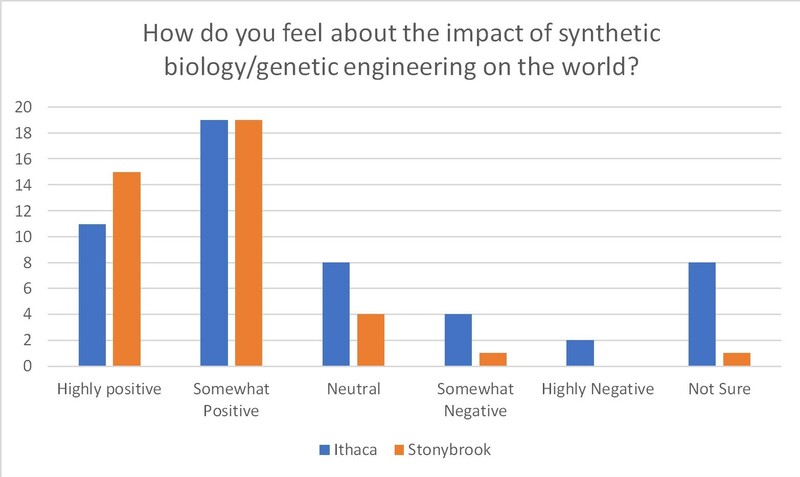 Although it appears that more people in Stony Brook viewed synthetic biology positively, we found that there was not a significant difference (p = 0.41) in how people felt about synthetic biology in Stony Brook versus in Ithaca. Although many people felt that synthetic biology was a positive influence on the world, they also felt as if synthetic biology should be more restricted to certain areas of science compared to others. There was no difference in this view between Stony Brook and Ithaca (p = 0.21). The results we gathered from our participants show us that we need to facilitate more conversation about synthetic biology in our community. We believe that the applications and possibilities of synthetic biology are endless. We hope that one day, others can also share this view. We started the survey primarily to analyze the impact of geography on the perception of synthetic biology. However, our analysis quickly expanded beyond that. Compared to synthetic biology, the term “genetically modified organism”, or GMO, has a much more negative connotation. GMOs are widely accepted by the general public to be unsafe and unhealthy. We wanted to analyze two things: understanding and perception. We hypothesized that people would answer the same question differently if we used synthetic biology instead of GMO. The line y=x corresponds to people who provided the same answer to both questions. 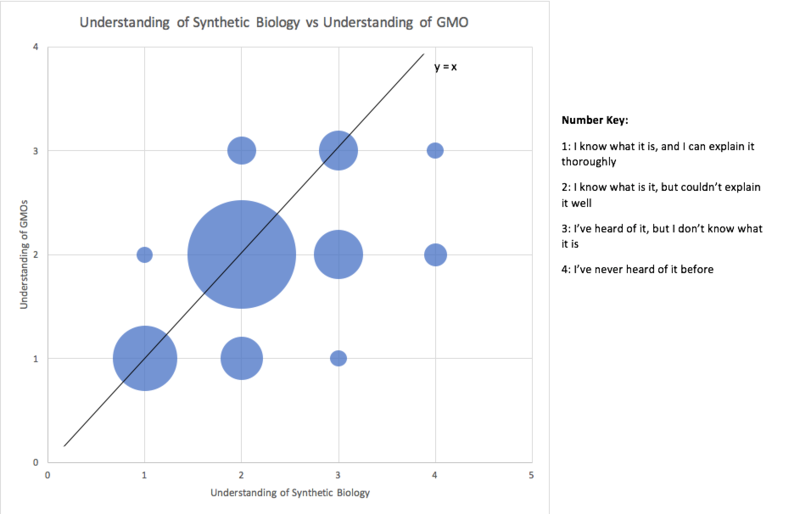 People who understand more about synthetic biology than GMOs lie above the line; people who understand more about GMOs than synthetic biology lie below the line. Most people appeared to have an equal understanding of synthetic biology and GMOs. However, there are more people clustered under the line rather than over the line, indicating that people tend to have a better grasp of GMO than synthetic biology. While a few people answered that they had never heard of synthetic biology, no one answered that they had never heard of GMOs. This is likely due to the media attention placed on GMOs. When we tested for regression, we found that the difference in response was statistically significant (p = 3E-53), indicating that people had different understandings of the terms synthetic biology and GMO. With all the adverse attention focused on GMOs, we also wanted to know if that affected people’s perceptions. We asked people about their thoughts on the impact of synthetic biology and the impact of GMOs. Points on the line y=x show indicate people who felt similarly about synthetic biology and GMOs. Above the line is people who felt that GMOs have a more positive impact. Below the line is people who felt that GMOs have a more negative impact compared to synthetic biology. There are a significant number of people who feel the same way about both, but we can see that there are far more people below the line than above the line. 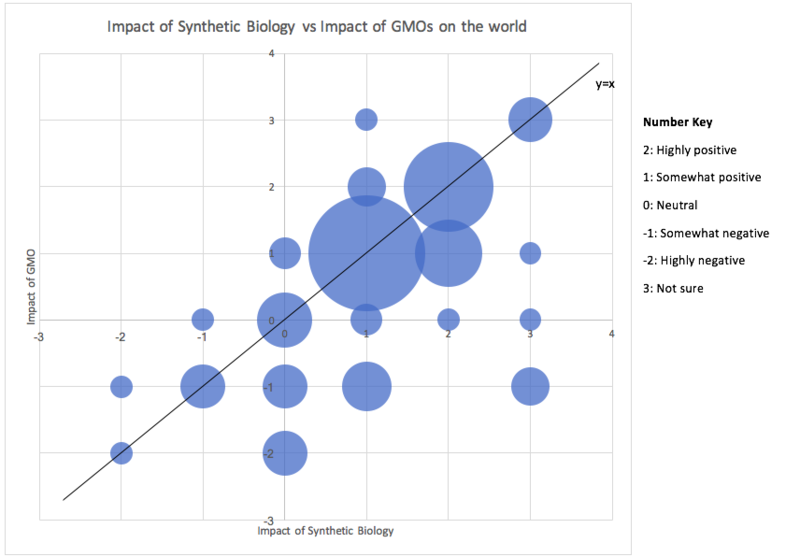 This demonstrates to us that people feel more negatively about the GMOs compared to synthetic biology (p = 2E-17). This confirmed our hypothesis, that society has twisted our views of GMOs as unacceptable, but hasn’t said anything about synthetic biology. We analyzed whether external factors impacted a person’s answer. We considered many variables, but here we highlight the results for education level and political affiliations. Education Level: We found that education level did not significantly affect a person’s answer (p = 0.10). When we compared the percentages of positive responses and negative response across the bars, they stayed relatively the same for each education level. 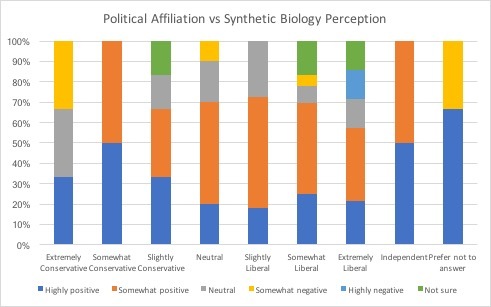 Figure 7: Do political affiliations affect how people perceive synthetic biology? The bars represent different political affiliations and each color represents a different feeling about synthetic biology, where the more positive feelings are towards the bottom of the bar and the more negative feelings are towards the top. Political Affiliation: We found no correlation between people’s political leanings and their view of synthetic biology. Our analysis comparing the percentages of positive responses and negative responses resulted in a p-value of 0.8. Altogether, there appears to not be a significant impact of education level and political affiliation on the survey responses. We continued our analysis by conducting a multiple regression analysis, to test the impact of several factors on a person’s understanding of synthetic biology. Our results are shown below. Our regression analysis suggests that there is no significant correlation between any one individual variable and the perceived potential of synthetic biology. However, by considering all variables simultaneously, we observe a significant correlation (F = 1.23E-10). This has important implications. In order to encourage the population to support and make informed judgments on synthetic biology, we must address multiple factors simultaneously. Our results reveal that most of our independent variables are not strongly correlated in a pairwise manner, which bolsters the statistical strength of our multiple regression. The two variables that have significant pairwise correlation are perceived understanding of synthetic biology and perceived understanding of genetically modified organisms. This is reasonable, given that genetically modified organisms are deeply tied to synthetic biology. We acknowledge that multiple biases that may have influenced our statistical results. First, there is some degree of convenience sampling. For the Stony Brook responses, the majority of responses came from college students who identify as politically liberal. This skewed the data, since college students do not represent the general population. We also recognize the existence of reporting bias, which may be especially significant in the current political climate. It is likely that those who align with conservative policies are less likely to reply out of perception that manipulation of genomic information is associated with more liberal policies. Despite this, we believe that the responses received in Ithaca and other regions of upstate New York are a fair representation of the general New York State population. We carefully designed our survey to avoid misleading questions as well. Stockholm’s iGEM team created a human practices handbook to help provide iGEM teams guidelines about how to effectively engage in human practices activities of all types. Our team did well with our past projects particularly in the areas of integrating user feedback and understanding the larger context of the technology we were developing. We provided the Stockholm team our insights regarding timeline, focus, team delegation, goals, and interviewing strategy - all with particular focus to our past year’s tackling bovine mastitis with bacteriocins: Legendairy. We believe that passing on the knowledge we have gained through our past experiences in human practices is valuable to the entire iGEM community to develop advancements in synthetic biology with applications in mind.